Show them how much you love them with our jeweled Monroe Lip Compact! 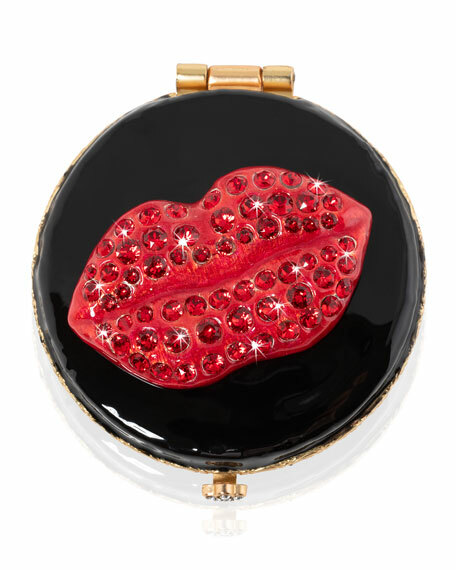 Luscious red enameled lips pave in Ruby crystals from Swarovski® on a jet black enameled compact. Gently push the jeweled button closure and reveal two mirrors to make sure you always look gorgeous. Brass with a 14K gold finish, hand-enameled and hand-set with Swarovski crystals. Brass with a 14-karat gold finish. Two interior mirrors: one regular and one magnified.